Serratia marcescens, a frequent agent of catheterization-associated bacteriuria, strongly adheres to human bladder epithelial cells in culture. The epithelium normally provides a barrier between lumal organisms and the interstitium; the tight adhesion of bacteria to the epithelial cells can lead to internalization and subsequent lysis. However, internalisation was not shown yet for S. marcescens strains. Elektronmicroscopy and the common gentamycin protection assay was used to assess intracellular bacteria. Via site directed mutagenesis, an hemolytic negative isogenic Serratia strain was generated to point out the importance of hemolysin production. We identified an important bacterial factor mediating the internalization of S. marcescens, and lysis of epithelial cells, as the secreted cytolysin ShlA. Microtubule filaments and actin filaments were shown to be involved in internalization. However, cytolysis of eukaryotic cells by ShlA was an interfering factor, and therefore hemolytic-negative mutants were used in subsequent experiments. Isogenic hemolysin-negative mutant strains were still adhesive, but were no longer cytotoxic, did not disrupt the cell culture monolayer, and were no longer internalized by HEp-2 and RT112 bladder epithelial cells under the conditions used for the wild-type strain. After wild-type S. marcescens became intracellular, the infected epithelial cells were lysed by extended vacuolation induced by ShlA. In late stages of vacuolation, highly motile S. marcescens cells were observed in the vacuoles. S. marcescens was also able to replicate in cultured HEp-2 cells, and replication was not dependent on hemolysin production. The results reported here showed that the pore-forming toxin ShlA triggers microtubule-dependent invasion and is the main factor inducing lysis of the epithelial cells to release the bacteria, and therefore plays a major role in the development of S. marcescens infections. The opportunistic pathogen Serratia marcescens is a common cause of urinary tract and ocular lens infections. It has also been linked with endocarditis, osteomyelitis, septicemia, wound and respiratory tract infections . There have been frequent reports of S. marcescens outbreaks in intensive care and neonatal care units [3, 8, 11, 29]. Potential virulence factors involved in this pathogenicity are proteases, a nuclease, a lecitinase, and the hemolysin, all of which are secreted by the bacterium. A 56-kDa serine protease from S. marcescens has been shown to promote keratitis by cleaving IgG, IgA, and lysozyme . The best-studied pathogenicity factor is the hemolysin ShlA, which causes hemolysis of human and animal erythrocytes  and the release of the inflammatory mediators histamine and leucotrienes from leukocytes . A previous study  has shown an increase in the pathogenicity of Escherichia coli strain 536/21 after transformation with the S. marcescens hemolysin genes. The renal colonization of this strain was more than five times higher than that of the ShlA-negative recipient strain in an experimental rat pyelonephritis model. In addition, this hemolysin has been shown to be cytotoxic to epithelial cells in culture . These data imply a major role of the hemolysin in pathogenicity; however, the experiments have been mostly carried out with the purified hemolysin protein. Recently, it has been shown in a Caenorhabditis elegans infection model that a ShlA-negative mutant is no longer pathogenic . Although there are frequent reports of nosocomial Serratia outbreaks, the molecular mechanisms of S. marcescens pathogenicity in vivo are still poorly understood. The first step in infection is adhesion to the target tissue surface. S. marcescens has the ability to attach to hydrophobic surfaces. Tight adhesion to a variety of surfaces, mainly by hydrophobic interaction, has been shown [2, 5, 7, 23]. Adhesion to epithelial cells mediated by the type 1 fimbriae of S. marcescens has been described [22, 39], and the fimbriae of S. marcescens have been shown to contribute to superoxide production [24, 26] and phagocytosis . These findings underline the importance of a tight physical contact of S. marcescens to the target cell in pathogenicity. Bacterial species capable of secreting a homologous cytolysin are Proteus mirabilis, Edwardsiella tarda, and Haemophilus ducreyi. P. mirabilis adheres to urinary tract tissues by fimbriae. Invasion of P. mirabilis after adherence is mainly determined by their „swarming motility" . Edwardsiella tarda has also been shown to be intracellular . We are not aware of any report in the literature showing any strain of S. marcescens with an invasive phenotype. In a parallel study, we have shown that invasive S. marcescens cells adhere to the bladder carcinoma cell line RT112 and other epithelial cells mainly via type I fimbriae . Here, we showed that S. marcescens strains with a reduced adhesive phenotype were also reduced in their invasiveness. Invasion was not only influenced by the adhesion capacity, but also by the expression of the cytolysin. Hence, we discovered a new feature of the opportunistic pathogen S. marcescens – the invasiveness in various human epithelial cell lines. The bacterial strains, plasmids, and epithelial cell lines used in this study are listed in Table 1. Bacterial cells were grown in TY medium consisting of 0.8% tryptone [Difco Laboratories], 0.5% yeast extract, and 0.5% NaCl at pH 7.0. Cultures of HEp-2 cells [ATCC CCL 23] were maintained in Dulbecco's minimal essential medium [DMEM] supplemented with 5% fetal bovine serum without antibiotics. RT112 cells [bladder carcinoma cell line] were maintained in Waymouth's medium supplemented with 10% fetal bovine serum without antibiotics. HeLa [ATCC CCL 2] and Hec1-B [ATCC HTB 113]] cells were maintained in RPMI medium supplemented with 10% fetal bovine without antibiotics. Cells were grown in 75-cm2 flasks at 37°C under a 5% CO2, humidified atmosphere. Confluent stock cultures were trypsinized and seeded in 96-well culture plates [Corning Costar, Wiesbaden, Germany] and incubated until confluent. The kanamycin box from plasmid pUC4-K was excised with SalI and ligated into SalI-digested plasmid pGP704, yielding pRSM01 [5.0 kb, ApR, KmR], which was introduced into Escherichia coli strain SM10[λpir] by transformation. The gene fragment encoding the C-terminal domain of ShlB [from position 654 to 1670 in shlB], the intergenic region including the promoter of shlA [from position 1671 to 1718] and the N-terminal domain of ShlA [from position 1719 to 2486] was generated by excising a 1.832-kb SphI fragment from pRO2 and ligating this fragment into the SphI site of pRSM01, yielding pRSM02 [6.8 kb]. pRSM02 was digested with SgrAI and religated to give pRSM03. This step looses a 741-bp internal DNA fragment, encoding the 22 C-terminal amino acids [aa] from ShlB and 190 N-terminal aa from ShlA. The resulting suicide plasmid was introduced into S. marcescens strain W225 by conjugation. Out of 800 kanamycin-resistant exconjugants, two were shown to be hemolytic negative. Homologous recombination was confirmed by sequencing chromosomal PCR fragments derived from the shlB/shlA locus. For complementation of hemolytic negative S. marcescens mutants, a polyvalent expression vector (pMMB67EH) was used. The shlB/shlA operon from pRO3 was excised with BamHI/HindIII and ligated into pMMB67EH yielding pRSC01. pRSC01 was transformed into E. coli HB101 containing the helper plasmid pRK2013. This strain was then conjugated with S. marcescens mutant strain SM001. Exconjugants were isolated under carbenicillin restriction (100 μg/ml) and by eliminating HB101 with 5 μg/ml tetracycline, against which S. marcescens is resistant. Hemolysis was determined as described previously [6, 15]. Briefly, serial dilutions of hemolytic samples were prepared with phosphate-buffered saline [PBS] or HU buffer [6 M urea in 50 mM HEPES [N-2-hydroxyethylpiperazine-N'-2-ethanesulfonic acid], pH 6.8]; 100-μl aliquots of each dilution were incubated with 1 ml of erythrocyte suspension for 15 min at 22°C and then centrifuged for 1 min in a microcentrifuge. The absorbance at 405 nm [A405] of released hemoglobin was measured spectroscopically. S. marcescens was cultivated for 18 h in TY medium with shaking at 29°C. Bacteria were harvested by centrifugation and washed once with HBSS [Hank's balanced salt solution, Sigma, St. Louis, Mo.]. Bacteria were resuspended in HBSS and adjusted to an optical density at 578 nm of approximately 0.5 [≈5 × 108 cells/ml]. A 100-μl aliquot of a 1:10 dilution of bacteria in HBSS was centrifuged in a 96-well plate onto, with 3.7% paraformaldehyde [PFA] solution [0.2 N HEPES, pH 7.2; 3.7% PFA, Sigma, St. Louis, Mo.] freshly fixed epithelial cells [1 × 105 cells/well]. This equals a multiplicity of infection [MOI] of 50 bacteria per cell. Bacterial suspensions were incubated with the fixed, washed cells in HBSS for 1–2 h at 37°C. Adherent bacteria were determined by MTT [3-[4,5-dimethylthiazol-2-yl]-2,5-diphenyl-tetrazoliumbromide] as described . For microscopy, adherent epithelial cells were cultivated on a cover slip, fixed or left unfixed, and then incubated with bacteria for 1–2 h at 37°C. After washing, the bacteria were fixed with 70% ethanol and stained with 10% Giemsa stain. HEp-2 and RT112 epithelial cells were cultured in a 24-well plate until they reached confluence. The number of cells was determined. Bacterial cultures were grown to mid-exponential phase and centrifuged. The bacterial cells were resuspended in appropriate volumes of HBSS; 100 μl of the suspension was added to each well of a 24-well plate containing nearly confluent monolayers of ~5 × 104 epithelial cells per well and incubated for 2 h at 37°C. The gentamycin protection assay was carried out as previously described . The concentration of 100 μg gentamycin/ml used in the cell culture medium was toxic for Proteus mirabilis VI, E. coli BL21, and all S. marcescens strains tested. After incubation, cells were washed three times with PBS and lysed with 1% Triton X-100; the resulting supernatants were serially diluted and the CFU on LB agar plates were determined. The results for each experiment are the average of an assay performed in triplicate and independently repeated three times. For assaying intracellular replication, HBSS containing 100 μg gentamycin/ml was replaced after 2 h with either HBSS or HBSS containing 4 μg gentamycin/ml. After incubation for 1–2 h in HBSS [with or without gentamycin] under a 5% CO2 atmosphere at 37°C, the number of viable bacteria in the supernatant and cell-associated bacteria were counted as described above. RT112 cells were incubated with W225 at an MOI of approximately 5 for 60 min and then fixed with 3% glutaraldehyde. Ultra-thin slices of infected epithelial cell monolayers were transferred to carbon-pioloform-coated copper grids [200-mesh], stained by floating for 1 min on a solution of 1% [w/v] uranyl acetate in water, briefly washed in water, and air-dried. The grids were observed with a Philips CM10 transmission electron microscope at an acceleration voltage of 60 kV. Release of LDH from eukaryotic cells indicates permeability of the membrane and cell death. The amount of LDH release was determined with a micro-plate assay according to the instructions of the manufacturer [Roche, Mannheim, Germany]. Epithelial cells were incubated with inhibitors [see Table 3] for 1 h at 37°C under a 5% CO2 atmosphere prior to adding bacteria. The culture supernatant was replaced by HBSS. The epithelial cells were then incubated with bacteria as described for the gentamycin protection assay. To obtain homologous chromosomal recombination with a defective hemolysin gene, a strategy according to Mekkalanos  was used. Briefly, a C-terminal portion of ShlB and an N-terminal fragment of ShlA were cloned into the suicide vector pGP704, yielding pRSM02. With an additional SgrAI-digest, a deletion of 741 bp between shlB and shlA was created which included a C-terminal portion of ShlB [22 aa] and an N-terminal portion of ShlA [190 aa]. This plasmid [pRSM03] was introduced into S. marcescens strain W225 by conjugation. Homologous chromosomal recombinants were selected for by kanamycin resistance. Hemolytic-negative insertion mutants were screened for by the absence of zones of lysis on blood agar plates and by lack of lysis in a liquid hemolysis assay. After isolation of hemolytic-negative mutants SM001 and SM011, the genomic recombination region in the shlB/shlA locus was amplified by PCR and sequenced to confirm the mutation. Mutants SM001 and SM011 were confirmed as having the same insertion in, and deletion of the intergenic shlB/shlA region including the promoter and the N-terminal 190 aa of ShlA. The isogenic hemolytic-negative mutant strains of S. marcescens W225 [SM001] and [SM011] were non-toxic on cultured epithelial tissue cells [Fig. 1]. However, SM011 showed a residual cytotoxic activity reproducibly higher than strain SM001 [for unknown reasons] and was therefore no longer examined in this study. [A] Cytotoxicity [by LDH assay] of different S. marcescens strains on RT112 cultured [black bars] and Hep-2 [gray bars] epithelial cells after 1-h incubation at 37°C [MOI 5]. E. coli [E.C.] BL21 pT7-5 served as a negative control. Strain SM001 was then complemented with pRSC01, carrying the shlB/shlA operon on the expression plasmid pMMB67EH. Efficient restoration of hemolytic/cytotoxic activity is shown in Fig. 1. All Serratia strains tested adhered specifically to confluent monolayers of RT112 and HEp-2 cells. However, above an MOI of 10, viable epithelial cells were lysed rapidly within the first 15 min of incubation by the produced hemolysin. The S. marcescens hemolysin [ShlA] secretion, together with the tight contact to the epithelial cells, is a serious interfering factor in studies of bacterial adhesion and internalization. Therefore, bacterial adherence was quantified only on fixed cells with an MOI of 50 [Fig. 2]. These data confirmed the adhesion capacity of our clinical isolates to epithelial cells, but showed strain-specific differences in the yield. An LDH cytotoxicity assay on viable cells showed that less-adherent strains were slightly less cytotoxic at an MOI of 5 [Fig. 1] except hemolytic negative mutant SM001 and E. coli BL21 expressing ShlA. The use of the hemolytic-negative mutant of strain W225 circumvented the cytotoxicity and enabled the role of ShlA in adhesion to be studied. The hemolytic-negative mutant was not altered in adhesion capacity compared to the wild-type, which provided evidence that the hemolysin was not involved in adhesion [Fig. 2] as E. coli BL21, pRO3, which secreted activated ShlA into the supernatant with a portion of ShlA remaining cell bound , showed a virtually non-adhesive phenotype. To quantify the internalization of S. marcescens into epithelial cells, a standard gentamycin protection assay  with the clinical S. marcescens isolates VA15854, W1128, W225 and CDC04:H4 was used. Non-invasive E. coli BL21 was used as a control. The gentamycin protection assay was first done with bacteria on PFA-fixed epithelial cells [MOI 2, 10, and 50]; all bacteria, adherent to epithelial cells or not, were efficiently killed by the procedure [data not shown]. Hence, the bacteria were not protected from gentamycin by tight adhesion or biofilm formation within the 2-h incubation time. Initial attempts to characterize S. marcescens host-cell interaction and invasion were confounded by vacuolation and subsequent lysis of the cells induced by secreted and/or cell-bound ShlA . The cytotoxic effect was also confirmed by measuring the cellular ATP level, which markedly decreased within 15 min [data not shown], and an LDH release cytotoxicity assay, which indicated significant cell lysis at an MOI of 10 [Fig. 3]. To avoid the cytotoxicity effects, RT112 and Hep2 epithelial cells were inoculated with E. coli BL21 or the S. marcescens strains W1128, W225, CDC04:H4, and SM001 at an MOI of approximately 2. After 30 min post-infection at 37°C, the epithelial cells appeared to be intact, and no extended vacuolation was observed by phase-contrast microscopy. After 60 min post-infection, cells appeared compromised, but virtually still intact. Evidence of mostly intact cells was given by negative trypan blue and propidium iodide staining [data not shown]. After 120 min post-infection, extended vacuolation was seen even with an MOI of 1 to 2, and cell lysis increased, as was also shown by propidium iodide uptake into nuclei and the video taken with these experimental settings http://www.mikrobio.uni-tuebingen.de/ag_hertle/projects/. Beyond 60 min incubation time, you see an increasing number of extracellular bacteria. These bacteria could either be from extracellular proliferation or from lysed cells which had released their intracellular bacterial load. To minimize bacterial growth, the medium maintaining the epithelial cells contained no serum, glutamine, or glucose [HBSS]. The increase in total bacterial yield after 2 h incubation with the epithelial cells and without gentamycin was about 5 to 10% of that of the inoculum [counted by plating dilutions]. Relative adhesion of different S. marcescens strains on fixed RT112 [black bars] and Hep-2 [gray bars] epithelial cells after 1-h incubation at 37°C [MOI 50] detected by the MTT assay. E. coli [E.C.] BL21 served as a negative control. After 2 h of gentamycin treatment, cells were lysed, and viable bacteria were recovered by plating serial dilutions on agar plates. S. marcescens strain W225 was the most invasive of the strains tested [Fig. 4]. There were no significant differences in the infection of HEp-2, Hec1-B, or HeLa cells with strain W225 [data not shown]. Only RT112 cells seemed to be slightly more susceptible to S. marcescens invasion. Therefore, strain W225 was taken as the model strain on RT112 cells. The observation of intracellular bacteria was verified by electron microscopy of infected monolayers, showing bacteria enclosed in small and large vacuoles [Fig. 6]. Clearly visible bacteria are marked by arrows. Other structure in the vacuoles could not be identified clearly but may be bacteria outside the center of the cutting level. 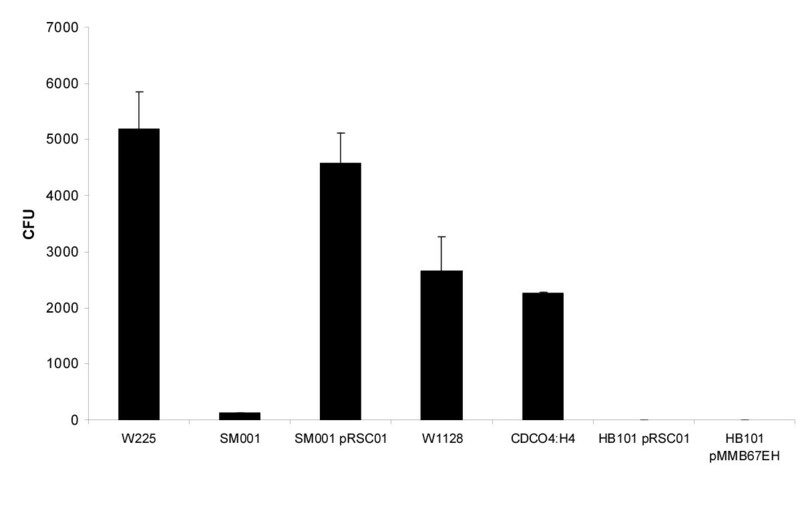 Cytotoxicity [by LDH assay] of different S. marcescens strains at an MOI of 2 [gray bars] and an MOI of 10 [black bars] on RT112 epithelial cells. Owing to the cytotoxicity of strain W225, it was necessary to use an MOI of 2 or below in order to minimize cytotoxicity. The hemolytic-negative derivative of strain W225 defective in hemolysin production and cytotoxicity [strain SM001], enabled bacterium–host interactions to be studied without killing the host cells too early. SM001 was much lower in its invasive ability than the parental strain [Fig. 4]. At a maximal MOI of 2, the mutant strain SM001 entered RT112 cells nearly ninety fold less efficiently than the parental strain W225, even though it adhered at a similar level [Table 2]. The complemented mutant strain SM001 pRSC01 showed about 88% of the wildtype activity in invasion [Fig. 4]. To confirm hemolysin secretion, the strains were cultured together with human erythrocytes. The lysis kinetics due to hemolysin secretion are shown in Fig. 5. Recombinant hemolysin-producing E. coli HB101 [pRSC01] [Fig. 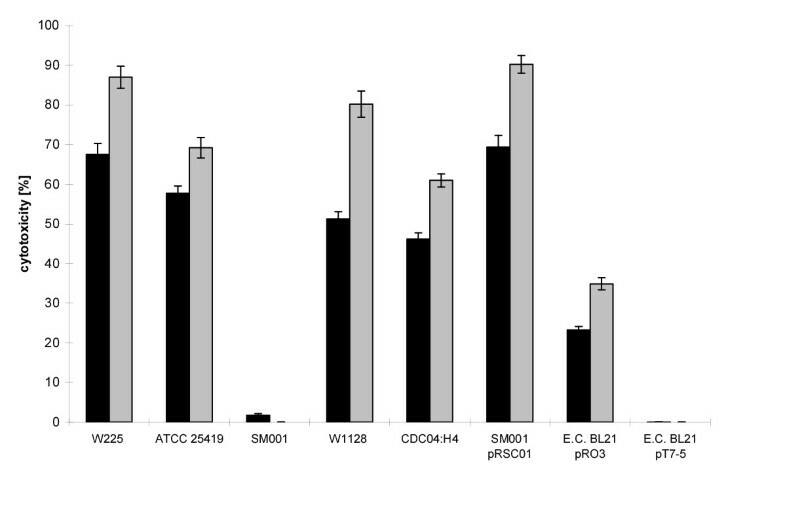 4] or E. coli BL21 [pRO3] were not enhanced in adhesion or in invasion [Table 2]. However, at a higher MOI [Table 2], different results were obtained. With hemolytic-negative mutant strain SM001, internalization was 3.3-fold higher at an MOI of 10 compared to the wild-type strain W225. 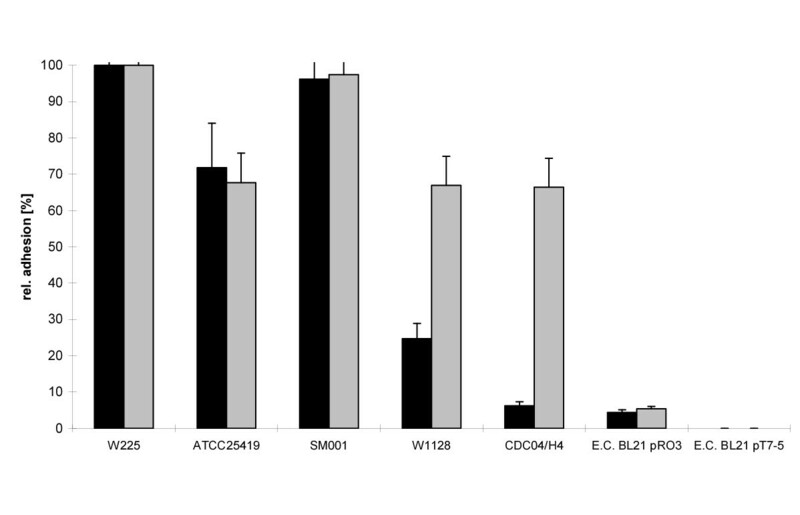 At an MOI of 10, the wild-type strain lysed nearly all epithelial cells during incubation [cytotoxicity in Table 2], which led to a decrease in the amount of viable intracellular bacteria protected against gentamycin. The complemented SM001 pRSC01 showed a slightly lower invasion rate but higher cytotoxicity [Table 2], which may due to the higher level of hemolysin expression with more copies of the expression vector, compared to the wild type W225. Invasion, adhesion and cytotoxicity of different bacterial strains at low and high MOI. Invasion: RT112 cells incubated for 2 h, 37°C with bacteria prior to addition of 100 μg/ml gentamicin; adhesion was measured by the MTT assay as described; cytotoxicity was determined at MOI 2 and 10 after 2 h of incubation. After 1 h post-infection with an MOI of 2 and following 1-h gentamycin treatment, highly motile bacteria were observed inside medium-sized [15–20 μm] vacuoles. The swimming speed of the bacteria [20 ± 5 μm/s] was about three- to fourfold higher inside the vacuoles than outside the cell [see movie at http://www.mikrobio.uni-tuebingen.de/ag_hertle/projects/ or additional file "movie"]. The video shows high motile S. marcescens W225 inside RT112 epithelial cell vacuoles. The video is divided in 10 sec scenes. Scene 1: 60 min after infection with MOI of 2 appears like the control except small pinpoint vacuoles; scene 2: 90 min after infection, visible vacuolation with single extracellular bacteria; scene 3: 120 min after infection, extended vacuolation with attached and swimming extracellular bacteria, addition of 100 μg/ml gentamycin; scene 4: 60 min later, osmotic swollen RT112 cells with intracellular bacteria. S. marcescens cells, driven by flagellae, changing their swimming direction after hitting the vacuolar membrane; scene 5–7: 90 min after gentamycin addition (210 min after infection), S.-marcescens-containing cells were detached from the tissue culture well, and appeared round and short before being osmotically lysed. In these compartments, up to six highly motile bacterial cells were counted. However, most vacuoles contained no bacteria. After 2 h of gentamycin treatment of infected epithelial cells [MOI of approximately 1], the culture medium was changed to HBSS with [4 μg/ml] or without gentamycin. The CFU of the culture supernatant and of the intracellular bacteria were periodically monitored up to 2 h. Owing to lysis of the epithelial cells maintained in HBSS containing gentamycin, the number of recoverable CFU of intracellular bacteria decreased. The CFU in the supernatant remained almost zero. In contrast, in gentamycin-free HBSS, the CFU in the supernatant increased continuously [data not shown]. The increase of CFU isolated from the adherent cultured cells from the initial 2,000 CFU to 5,500 CFU [Fig. 7] clearly showed that internalized S. marcescens cells were able to replicate inside the epithelial cells. The replication factors of intracellular S. marcescens cells were estimated to be 2.5 to 2.9/h for W225 compared to 2.5/h for the Pseudomonas aeruginosa PA01 control. However, during the incubation, epithelial cells were lysed by the bacteria, and higher numbers of CFU could be counted in the supernatant without gentamycin [data not shown]. Considering the CFU in the supernatant and cell-bound CFU together, the replication factors were estimated to be 3.4 ± 0.04/h for wild-type strain W225, 4.0 ± 0.11/h for mutant SM001 and only 2.6 ± 0.02/h for the control P. aeruginosa PAO1. Internalized hemolytic negative-mutant strain SM001 showed only a slight increase of the bacterial load in the supernatant compared to the isogenic wild-type strain. Despite the initial lower internalization level of mutant strain SM001, the proportion of internalized bacteria had a similar doubling time as the wild type W225. However, the number of CFU of mutant SM001 cells in the epithelial cells provided evidence that the hemolysin ShlA was not necessary for intracellular replication, but might play a role in the release from the cells. Invasion of different strains in cultured RT112 epithelial cells after 2-h incubation at 37°C at an MOI of 2. Hemolysis of human erythrocytes in coculture with bacterial cells; (◆)W225; (□)SM001; (■)SM001 pRSC01; (▲)HB101 pRSC01; (△)HB101 pMMB67EH; (○)BL21 pRO3; (x)BL21 pT7-5. Transmission electron micrographs of adherent S. marcescens W225 cells on RT112 epithelial cells and bacteria encapsulated in small and large vacuoles. Cells were incubated 60 min with W225 at an MOI of approx. 5. After significant vacuolisation was visible, cells were fixed with glutaraldehyde. Bacteria are marked by arrows. Bars represent 1 μm. 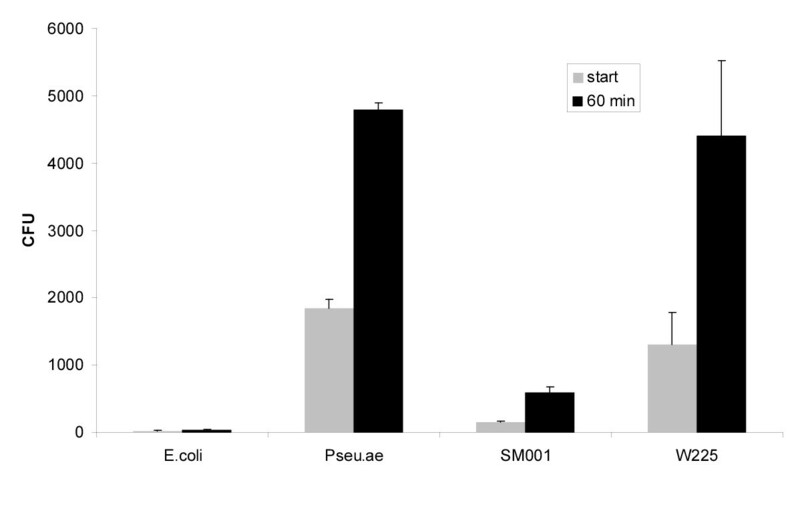 Replication of S. marcescens strain W225, hemolytic-negative isogenic mutant of strain W225 [SM001], E. coli K12-5K [negative control], and P. aeruginosa [positive control] inside RT112 epithelial cells after 60 min [black bars]. Grey bars show the starting values of a MOI of 1 after 2 h treatment with 100 μg/ml gentamycin. Incubation was continued with 4 μg/ml gentamycin for 60 min [black bars]. To determine the effects of various inhibitors on S. marcescens invasion, monolayers of RT112 epithelial cells were preincubated with each of the agents for 1 h. At an MOI of 2 and 10, inhibitors of protein biosynthesis [cycloheximide], receptor recycling [chloroquine] and receptor-mediated endocytosis [monodansylcadaverine] had no effect on RT112 invasion [Table 3]. At MOI 2, wortmannin increased the cytotoxicity of S. marcescens W225, and in turn decreased invasion. At MOI 10, virtually no epithelial cell remained intact to protect bacteria from gentamycin. As shown in Table 3, at MOI 2, cytochalasin D [depolymerizes actin filaments] decreased and colchizine [depolymerizes microtubules] and paclitaxel [stabilize "freeze" microtubules] inhibited invasion of S. marcescens strain W225 in RT112 epithelial cells. At a higher MOI [10 CFU/cell] colchizine and paclitaxel each decreased the yield of intracellular bacteria compared with epithelial cells not pretreated with one of these inhibitors. 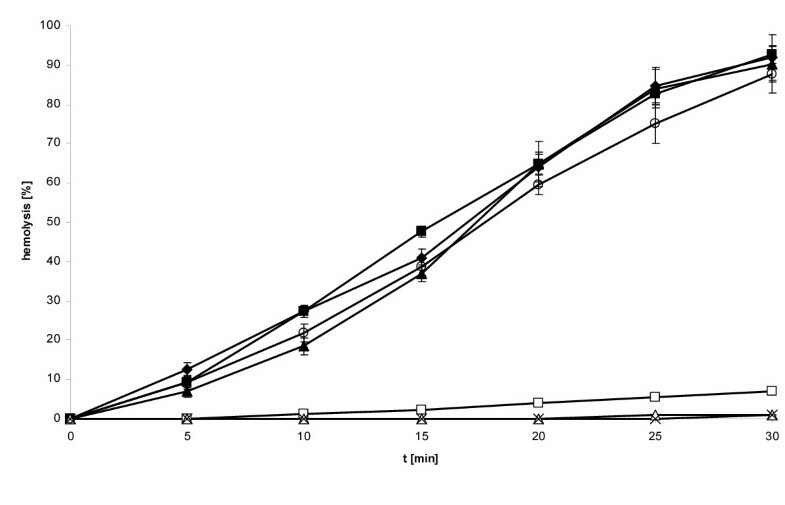 Simultaneously, cytotoxicity was tempered in increase at an MOI 10 [Table 3, right columns]. In contrast, cytochalasin D and wortmannin [vesicle trafficking inhibitor] treatment increased the cytotoxicity significantly even at an MOI of 2 and led to a decrease in viable epithelial cells, which led to a decrease in the number of gentamycin-protected bacteria. Apparently, RT112 epithelial cells were stabilized against the cytotoxic bacteria by inhibitors of microtubule filaments, and more RT112 epithelial cells were still viable despite the bacterial load. Therefore, protecting more intracellular bacteria against gentamycin. S. marcescens as a pathogen shows a tissue-damaging capacity [18, 24]. The cytotoxic activity is mainly elicited by the secreted hemolysin/cytotoxin ShlA . However, the role of ShlA, secreted directly by the bacteria during infection remained elusive. Another pathogen, Edwardsiella tarda, which has a hemolysin homologous to ShlA, has been studied in more detail , and a direct correlation between the presence of hemolysin and invasion in epithelial cells has been shown. Here, S. marcescens strains were tested for internalization in RT112 bladder epithelial cells and in HEp-2 cells using a commonly used gentamycin protection assay. S. marcescens was found to be intracellular. To our knowledge, this is the first report documenting S. marcescens as an invasive species. The number of intracellular bacteria was dependent on the particular bacterial strains, which differed in adhesion efficiency, hemolysin production, and the target epithelial cell line. The results showed that two main factors influence invasion: adhesion and cytotoxicity. One etiological mechanism in a urinary tract infection involves efficient adhesion to the epithelial tissue. To determine whether this mechanism is involved in the S. marcescens tissue-cell-culture infection model, the adhesion properties of several clinical isolates of S. marcescens were first evaluated. Adhesion and cytotoxicity properties of S. marcescens and closely related organisms are described to some extent in the literature. For Proteus mirabilis, fimbriae and properties such as swarming are more important than hemolysin production for host cell invasion . Adhesion to epithelial cells mediated by type 1 fimbriae of S. marcescens has also been reported [22, 39]. Fimbriae of S. marcescens also contribute to superoxide production [24, 26] and phagocytosis . Since S. marcescens W225 adhesion to RT112 epithelial cells is mediated by type I fimbriae , it is notable that type I fimbriae can function also as invasins . A role of the hemolysin in the adhesion process has not been examined in detail. The secretion of hemolysin interferes in adhesion studies with viable epithelial cells by lysing the cultured cell monolayer. To avoid cell lysis, adhesion has been studied best with fixed epithelial cells. However, the hemolysin is generally cell bound in S. marcescens ; therefore, ShlA might contribute to adhesion of the bacteria. To unravel the potential adhesive role of ShlA, hemolytic-negative isogenic chromosomal mutants of S. marcescens strain W225 were created by site-specific mutagenesis. One selected hemolytic-negative mutant, SM001, which lacks the shlB/A intergenic region was not altered in adhesion. This S. marcescens W225 mutant was significantly reduced in invasion at an MOI of 1 to 2 and was no longer cytotoxic. Compelemtation with the wildtype hemolysin genes rather restored the wildtype phenotype. Mutants of E. tarda defective in secretion of the ShlA homologue cytotoxin EhlA showed a similar phenotype, being no longer cytotoxic or invasive . 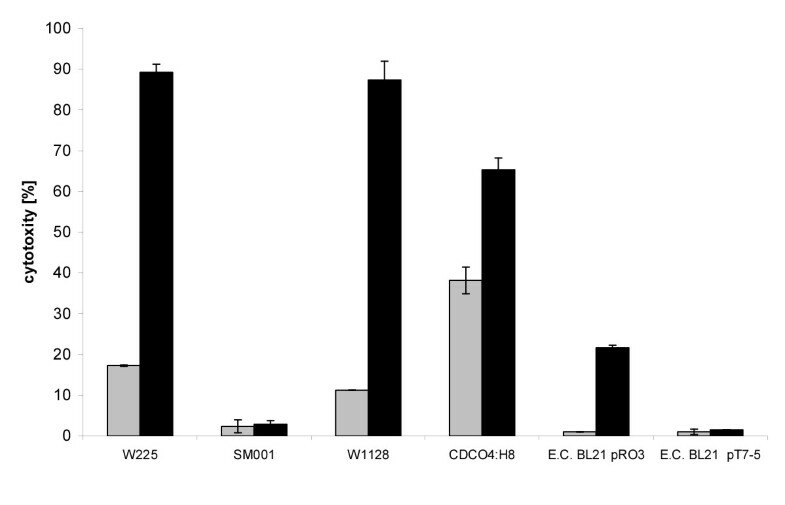 E. coli BL21 transformed with the shlB/shlA genes showed only a small increase in adhesion. That means that the hemolysin system is unlikely to act as an adhesion factor. Increasing the bacterial load increases the cytotoxicity, but in turn decreases the countable values of internalized and gentamycin protected bacteria due to lysis. This observation shows evidence for the confounding role of the cytolysin in the measurement of invasion in lytic doses. It was clearly shown here that secretion of ShlA was the main factor responsible for invasion at physiological low infection doses. The related organism Haemophilus ducreyi expresses a cell-associated hemolysin similar to ShlA. Clinical isolates of H. ducreyi are invasive for human epithelial cells, and the hemolysin enhances the invasion of HEp-2 cells . As in S. marcescens, cytotoxicity interferes in adhesion and invasion assays on viable cells in culture. Hence, ShlA facilitates the internalization and exploitation of the host cell, but other factors may also play a role. These results lead us to hypothesize that [i] a combination of adhesion and cytotoxicity is essential for invasion, and [ii] the invasiveness is a multi-factorial process in which ShlA plays a major, but also confounding role. Tight adhesion increased the cytotoxicity of the bacterial strains, probably by bringing the cell-bound cytotoxin in close contact to the target membrane. Subsequent perforation of the cell membrane and mediation of host-cell invasion by compromising and subsequent lysing the cells might enable S. marcescens to penetrate tissue layers and invade or disseminate in the host organism. This hypothesis is supported by the data of the hemolysin producing E. coli strains BL21, pRO3 and HB101 pRSC01. Virtually non-adherent, they showed cytotoxicity [due to expression of ShlA] but no internalization. In addition, the well adherent but hemolytic negative mutant SM001 also showed rather no internalization at an MOI of 2. Once attached to the epithelial cell, the bacteria were internalized. The cellular requirements of S. marcescens internalization in cultured epithelial cells were evaluated by pretreating the cells prior to Serratia application with a variety of inhibitors that act on different eukaryotic cellular processes and structures. Invasion of S. marcescens W225 in RT112 cells or HEp-2 cells was not inhibited by chloroquine and monodansylcadaverine, compounds known to inhibit receptor recycling, receptor-mediated endocytosis, and vesicle trafficking and therefore bacterial entry . However, the inhibitory result with wortmannin have to be judged concerning the cytotoxicity increasing capacity of this drug. This led to a decrease of viable tissue cells and therefore to appearent lower CFUs which were not correlated to a decrease in invasion and incorrectly implicated an inhibition of invasion compared to the untreated control. In this case, it is not possible to get a clear answer and the effect of wortmannin has not have to be elucidated further. Invasion of S. marcescens appeared to be dependent on microfilaments, such as actin fibers and microtubules. Disrupting actin filaments with cytochalasin D led to a 46% reduction in intracellular CFU, and colchizine treatment reduced the intracellular CFU to 23–25% of that of the controls. Therefore, only the CFU counted in the background of low cytotoxicity is considered to be valid. Our data showed that the inhibition of tubulin microfilaments by colchizine and paclitaxel resulted in both reduced cytotoxicity and reduced invasion. We considered this to be the only true case where invasion was inhibited because the epithelial cells were still viable at the end of the assay. Paclitaxel [taxol] "freezes" the microtubule network by crosslinking tubulin whereas colchizine depolimerizes tubulin fibers. The inhibition by both colchizine and paclitaxel implied a direct microtubule-driven invagination of membrane-bound bacteria rather than an uptake system involving microtubule filaments and a molecular motor, e.g., dynein or a member of the kinesin family. The movement of the activated motor system along the microtubule linked to a membrane-receptor/bacterium complex could cause invagination of the membrane and internalization of the attached bacterium . Such a system would be inhibited by colchizine, but not by paclitaxel, and was therefore excluded by the results obtained. The inhibitory effect caused by the dissolving of actin microfilaments by cytochalasin D was masked by the increased cytotoxicity and remains to be elucidated further. In contrast to other bacteria that replicate in the cytoplasm, such as Shigella flexneri or Listeria monocytogenes , S. marcescens apparently has no direct effect on actin and does not engage in direct cell-to-cell spreading [unpublished observation]. Furthermore, an infected cell adjacent to uninfected cells was typically observed. It was clearly shown, that S. marcescens W225 and the mutant SM001 replicated intracellularly. However, the value of intracellular replication was changed by the cytotoxicity of S. marcescens W225. Because of the lysis of the host cells, the number of gentamycin-protected bacteria decreased with time, and more CFU were isolated from the supernatant. The number of intracellular bacteria might even be higher than counted because gentamycin is lethal to bacteria in damaged and disintegrating cells [depending on the time needed for gentamycin to access the bacteria]. This was taken into account by changing the concentration of gentamycin from 100 μg/ml to 4 μg/ml or 0 μg/ml. Bacteria, actually released from the epithelial cells, can survive in the supernatant without gentamycin and will form CFU on TY-agar plates. Since virtually all extra cellular bacteria were killed by the gentamycin pretreatment, the sum of CFU recovered from the supernatant [without or low gentamycin] and the epithelial cells reflects the true increase in bacterial yield. For this reason, the CFU counts in gentamycin-protection assays have to be judged carefully. To summarize the data on the pathological phenotype of S. marcescens on tissue culture cells, cytotoxicity is the major factor. This cytotoxicity is excerted by a close contact of the pathogenic bacteria to the host cell mediated by fimbrial adhesion. The internalization observed at physiologically low bacterial doses was shown to be dependent on ShlA and on dynamic tubulin microfilaments. The cytotoxin ShlA may facilitate the entry but it is not absolutely necessary for internalization as shown by the hemolytic-negative mutant strain. However, one could suggest that cytotoxin production might kill immune cells during inflammation and help the bacterium to escape phagocytosis. This is an interesting hypothesis which future examination will shed more light on the role of this pore forming toxin in the pathogenicity of S. marcescens. We thank Prof. V. Braun for support and helpful discussions. This work was supported by the Deutsche Forschungsgemeinschaft [HE 3110/2-1]. RH is responsible for the initial finding of internalization and carried out all experiments and sample preparations. HS carried out the transmission electron microscopy.